Folding Voice - Aging, diversity, leadership and solutions. 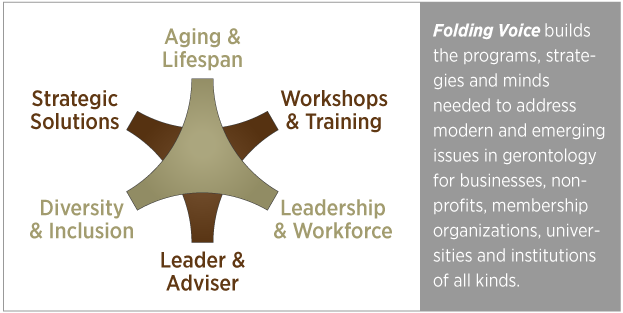 Folding Voice creates strategic solutions for businesses, organizations, and governmental entities facing aging-related challenges. 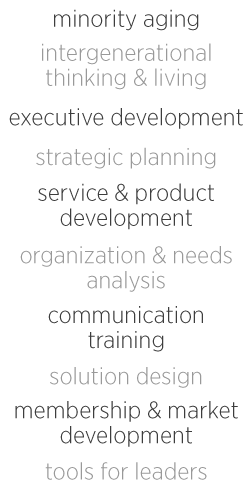 We provide strategic advice and planning, interim officers, leadership development, and simple but powerful ways of seeing, solving and acting on challenges in aging & lifespan, diversity & inclusion, and leadership & workforce. A Folding Voice blends challenge with opportunity, need with ability, and strength with flexibility. A Folding Voice is a creative, inclusive, and adaptive engine. Folding Voices thrive in the present and are prepared for the future.